BelarusDigest > All > Can new companies replace state giants in Belarus? Deputy Prime Minister Uladzimir Syamashka recently announced that full-cycle car production is to start in Belarus this month; this will be a first for the country. So far, only Chinese-designed cars have been assembled in Belarus. Meanwhile, the holding Amkodor presented its first tractor at the Belagro exhibition on 6-10 June in Minsk. This means that the Belarusian government has made another concession to the privately-owned holding, allowing it to challenge the national industrial giant MTZ, which has manufactured tractors for many decades. As most major Belarusian machine-building firms such as MAZ and MTZ struggle with problems, the government supports them to avoid social disturbances. Nevertheless, it also supports new projects, which create competition for existing enterprises and thus tacitly change the political economy of the state. Once, there was a private-sector initiative to launch joint car production with the American company Ford and the Iranian company Iran Khodro. Both projects were terminated after assembling only several hundred cars. Thus, the forthcoming launch of a full-cycle car production factory makes the joint Belarusian-Chinese project a remarkable achievement. Assembly production of Chinese-designed Geely cars began in Belarus in 2013. The new factory, near the city of Barysau, is set to reach a production level amounting to 60,000 cars a year by the end of 2017. From the outset, the government has emphasised that 90 per cent of these cars would be exported. Some exports to Russia and Kazakhstan have succeeded, albeit perhaps with Beijing's assistance. However, Minsk has also taken measures to ensure sales within the country. In April 2016, president Lukashenka announced that 'There will be no imported cars for civil servants, except for the prime minister, vice premiers, and top-ranking officials,' and stipulated that only Geely cars manufactured in Belarus be used for state needs. Moreover, as Tut.by noted, the new law regulating taxi firms looks as if it compels taxi drivers to buy Geelys. Another new project in the machine-building sector involves launching the production of a tractor by the holding Amkodor; this will compete with models offered by MTZ, a state-owned firm. The government has not only allowed Alyaksandr Shakutin, a co-owner of Amkodor, to challenge MTZ, it even intends to use Chinese loans to fund the project, including construction of a new plant. At first glance, this seems logical. Belarusian authorities consistently support the rising business empire of Shakutin. For example, on 24 May, Industry Minister Vital Vouk remarked on Shakutin's holdings Amkodor and Saleo's intention to invest $2.1bn in further expansion in 2016—2030. Both holdings have enjoyed success. Saleo was established by Shakutin and his partners in 2014 as a firm producing hydraulics for mobile machinery which had earlier been imported. By now, as Vouk emphasises, 30-60 per cent of necessary hydraulics are manufactured in Belarus. Shakutin emphasises that his business is all about manufacturing and insists on his patriotism. The Belarusian web-portal Tut.by, however, has pointed out that a very large share of his firms' sales involve Belarusian state purchases. He has also acquired several formerly state-owned enterprises without competition and for little money. Likewise, Shakutin used to employ a number of formerly high-level Belarusian state officials, such as Lukashenka's former economy assistant Siarhei Tkachou, BRSM (a pro-government youth union) leader Alyaksandr Nakhaenka, MAZ director Mikalai Kasten', transportation minister Ivan Shcherba, and others. This obviously strengthens his ties to the government, Tut.by points out. Shakutin responds to these comments by emphasising his efforts to export, underlining that the factories he bought were destitute and he salvaged them. He also claims that he employed former officials because of their superb managerial qualities. Nevertheless, Shakutin's ties to the government are obvious. For many years, he worked in the upper chamber of the Belarusian parliament and held a key role in the organisation of the pro-goverment Belaya Rus' movement. There has even been talk of EU sanctions, as he is 'Lukashenka's oligarch.' However, this is an unfair characterisation, as Shakutin is merely a tool for the Belarusian leadership. The government's decision to allow Shakutin to launch a project which could have an adverse impact on a Belarusian state-run company must be understood in context. A number of older, state-owned companies are seriously struggling. While three years ago MAZ was producing 24,000 trucks a year, this year the enterprise expects to manufacture less than 11,000. The government plans to provide financial support for the branch. On 24 May, Deputy Prime Minister Syamashka announced that the government was to invest $500m in MAZ, and $645m in Homselmash, an agricultural equipment manufacturer. For 2016-2030, MTZ needs $1.1bn of investments and has almost no funds of its own. It will take Minsk a significant amount of money to develop the plant, but the struggle may succeed. The case of BelAZ has served as an example for the Belarusian government: it invested $800m into the firm, which manufactures huge trucks. As a result, BelAZ developed new models and succeeded in increasing its share on the global market, which is now estimated at almost 30 per cent. Where exactly Minsk will find the money to invest in its machine building industry remains unclear. Government officials refer, inter alia, to Chinese loans; recent contacts with Beijing also support this hypothesis. Less clear is how Minsk will involve Russia in developing Belarusian industry: will it strive to limit cooperation or will it be willing to give the Russians anything if they can save companies from bankruptcy? Most probably, the government policy on Russian involvement will remain ad hoc and pragmatic. On 24 May, Deputy Prime Minister Syamashka revealed that during the recent Belarus-Russian negotiations on oil and gas, the two governments agreed to prepare proposals on three industrial integration projects – these concern the petrochemical and machine building enterprise. In 2011—2014, Belarus and Russia had already agreed on five industrial integration projects involving the Belarusian firms MAZ, Intehral, MZKT, Pelenh and Hrodna Azot. In recent years, however, Minsk and Moscow have kept silent on these projects. Minsk will certainly use cooperation with Russia to develop its machine building sector, but the Belarusian government is considering all its options. Thus, the authorities are promoting new privately-owned production projects. In the future, these could replace giants like MTZ. In addition, Minsk hopes to use China as a source of loan-funding and technology. In general, the development and state support of major Belarusian businesses such as Shakutin's holdings resemble the famous post-WWII South Korean business conglomerates called chaebols, the most famous of which are Samsung and Daewoo. These helped the government adapt and develop the national economy in exchange for state support. On 26 May, Archbishop Tadevuš Kandrusievič, the head of the Belarusian Catholic Church, announced that the Episcopate is working on an alternative to concordat. Concordat is a formal agreement regulating the relationship between the church and a secular state, with the Belarusian government. If he succeeds, this would probably be the first such agreement between the local Catholic Church (not Vatican) and the government. Leaders of religious organisations based in Belarus understand that strengthening their position vis-à-vis the government bolsters their image, allowing them to exert greater influence on society. In light of a recent study on religiosity in Central and Eastern Europe by the Pew Research Centre, there is a lot to fight for in Belarus. According to the study, the overwhelming majority of Belarusians believe in God and affiliate themselves with specific religious organisations. Nevertheless, the number of practising believers who regularly engage in religious activities is far smaller. Unexpectedly, Belarusian Protestants, not covered in the study, might be the de facto leaders on the ground. The most recent Pew study presents key findings regarding various aspects of religiosity in the former communist countries and sheds light on religious dynamics in Belarus. It appears that the vast majority of Belarusians (84%) declare they believe in God. This number contrasts to statistics in Belarus's immediate neighbours, such as Lithuania (76%) or Russia (75%). More people declare they believe in God only in Poland and Ukraine (both 86%). Therefore, it would seem that Belarus is fertile ground for religious organisations, despite decades of state-enforced secularisation. Eastern Orthodoxy dominates throughout the region, and this holds true for Belarus as well. As the study shows, 73% per cent of Belarusians identify themselves as Orthodox, 12% as Catholics, 3% declare no affiliation, and 12% are affiliated with other confessions. Despite the high number of believers, a closer look into the reasons behind personal religiosity shows that for many people, religion holds a more ceremonial significance. For example, only 23% of Orthodox Christians relate their religious identity with personal faith, and slightly above half of them emphasise the importance of religion for their national identity or family background. This is less true for Belarusian Catholics, 40% of whom connect it with personal faith, and 42% explain their religious identity in terms of national/family culture. Belarusian believers: in word only? A more practical look at religiosity can better explain the dynamics of religion on the ground. In Belarus, it appears that a typical believer rarely attends service: 12% of respondents said they do so once a week. This is twice more than in Russia (6%). In contrast to Orthodox believers, 25% of Belarusian Catholics attend service weekly, as do 43% of Ukrainian Catholics. In fact, according to the Pew study, Belarusian Catholics tend to engage more often in religious activities, such as daily prayer and reading scriptures, at least monthly outside the church. The Pew report presents Belarus as following larger trends in religious dynamics throughout the region as well as in Western Europe. People claim to have an interest in religious matters, but tend not to regularly practise their faith. With regard to Belarus, this is largely explainable by its post-Soviet legacy. As the Pew report demonstrates, there is a correlation between religious affiliation and national identification. With regard to Belarus, less than a half (45%) connect religion with their national identity. Ukrainian (57%) and Russian (51%) respondents are more likely to connect these two issues. Membership to religious groups, as with any other type of membership, contributes to the process of socialisation of specific values, norms and attitudes. Thus, religious affiliation often corresponds to political orientation. For example, members of predominately Orthodox societies in the region tend to support the sentiment that Russia ought to act as a balance for the West. The vast majority of Belarusian respondents (76%) agree with this view. In contrast, only 22% of Ukrainians agree with Russia's need for a natural geopolitical buffer zone, most likely due to the ongoing conflict between the two countries. In other neighbouring countries, such as Poland and Lithuania, significantly fewer people support this view (in both cases 34% of the population). Notably, the Pew study also examines national attitudes towards democratic vs. other forms of government. Accordingly, in Belarus, as in Ukraine, slightly more people favour democracy (38%) to those who support other forms of government (25%). Russians, to the contrary, prefer other forms of government (41%) to democracy (31%). Lithuanians favour a democratic form of government the most (64%), whereas less than half of Poles do (47%). Belarusians even have their own Christian-Democratic political party, co-chaired by Paviel Sieviaryniec and Vitali Rymašeŭski. In the end of May, the party leadership and its members celebrated the 100th anniversary of its establishment. Today, the party attracts mainly opposition-minded politicians who claim to respect Christian values. As the news portal Krynica.info informs, since 2007 the leaders of the party have attempted to register officially 20 times, with no success. Is Belarus nominally Orthodox, but practically Catholic and Protestant? One of the major features of religious life is its communal character. The majority of Belarusian respondents (62%) emphasise that the chief role of religion boils down to bringing people together. Slightly more people (64%) think that the religious institutions should strengthen morality in society, while nearly a half (49%) consider support for the poor and people in need to be the key responsibility of religious institutions. 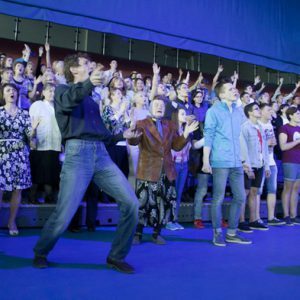 Christian organisations in Belarus willingly engage in charitable activity. The Catholic Church, for example, does this mainly through the organisation Caritas. Certain Protestant congregations offer support for alcoholics. When it comes to public initiatives, the churches are able to speak the same language. For example, they are all involved in the pro-life movement. The newspaper Naša Niva reports that in 2013, the Belarusian Orthodox Church, together with the Catholic Church, Belarusian Christian-Democracts, and other civic organisations, supported a rally against abortion. Certain Christian churches feature activity related to national revival on their agenda. For example, in an interview in 2017 with Belapan, an independent news agency, the Apostolic Nuncio to Belarus rather proudly noted that the Catholic Church engages in strengthening the national identity of Belarusians. The Pew report, although very comprehensive, gives an incomplete picture of the religious dynamics among Belarusian Christians. Unfortunately, the authors focused predominantly on the Orthodox-Catholic paradigm, excluding Protestant minorities. Although they constitute only a small part of the population in Belarus, their activism is a remarkable phenomenon, especially given the restrictions they face from the government. In 2015, 31.9% of all registered religious communities in the country were Protestant, which is significantly more than Catholics (14.8%) but less than Orthodox (49.6%). With this in mind, along with peoples' real engagement in religious activity, it is no longer a given that Belarus is an Orthodox country.